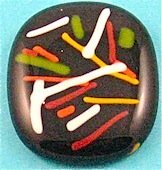 Kiln formed glass stringers pendant with random colors fused to a black base to make a small piece of fused jewelry. It is a very simple item to make and is a colorful piece of fused art jewelry when finished. The size and colors can be altered if you wish to change the design. System 96 can be used for this pendant in place of Bullseye products. Two pieces of black Bullseye glass, 1 1/4" wide x 1 7/8" long. Step 1. Cut black fusing glass to size. Step 2. Cut or break stringers into different lengths. Step 3. Wash and dry items thoroughly. Step 4. Stack layers on prepared kiln shelf and place multi-colored pieces randomly on top of black base. Step 5. Place the shelf into the kiln, gradually bring the temperature up to about 1500° F (815° C) and hold for about 20 minutes. Check to see that is fully fused, if necessary hold longer. Once the item is completed switch off kiln and allow to cool to room temperature. Step 6. Remove fired object from kiln, roughen up small area on back of pendant with sand paper. Use two-part epoxy glue to attach metal bail to rear of pendant. If you don't wish to use a bail then the item can be drilled to take a jump ring . Different colors can be used for the base. Pieces of broken confetti can be used instead of stringers. Mica may also be included as a design element in this jewelry style.